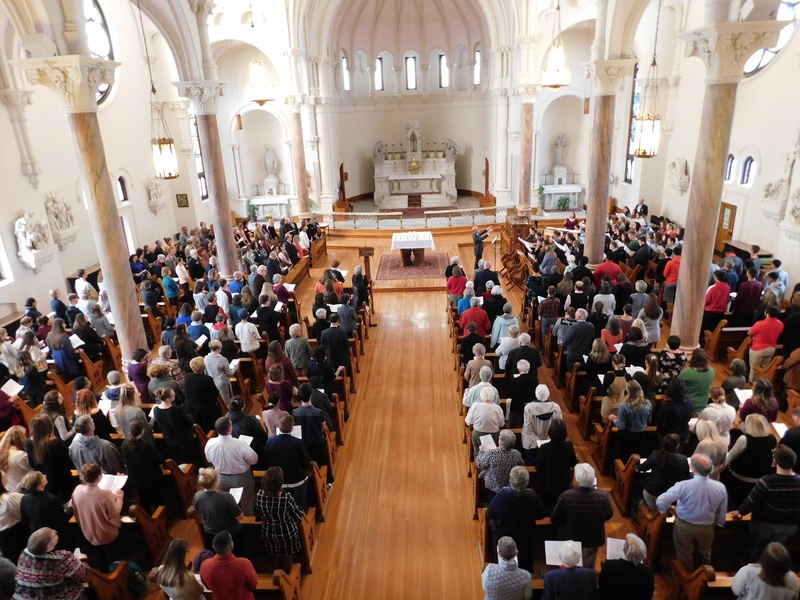 Members of the Seton Hill community gathered in St. Joseph Chapel on Oct. 30 to remember the lives lost in the Tree of Life synagogue shooting in Squirrel Hill that occurred on Oct. 27. Photo by H.Carnahan/Setonian. Mass shootings are not uncommon in the United States. As of Nov. 28, there have been 323 mass shooting incidents in 2018, according to the Gun Violence Archive. But when one of these shootings occurs 45 minutes from home, the local community feels the impact. On Oct. 27, 46-year-old Robert Bowers opened fire during the morning service at the Tree of Life Congregation synagogue in Squirrel Hill, Pa. Eleven people were killed and six were injured. Among the 11 victims were Daniel Stein, 71; Joyce Feinberg, 75; Richard Gottfried, 65; Rose Mallinger, 97; Jerry Rabinowitz, 66; brothers Cecil Rosenthal, 59, and David Rosenthal 54; husband and wife Bernice Simon, 84 and Sylvan Simon, 86; Melvin Wax, 88; and Irving Younger, 69. Members of the community hold their candles during the vigil at the Westmoreland County Courthouse in Greensburg on Oct. 29 for the victims of the shooting at the Tree of Life synagogue in Squirrel Hill. For O’Brien, the shooting was particularly impactful. She grew up close to Squirrel Hill, in Lawrenceville, and said she often drove past the Tree of Life synagogue. SHU responded quickly, with a memorial service on Oct. 30, three days after the shooting. The university cancelled classes during the time of the service to give all students and faculty the opportunity to attend. David Stanger, associate professor of art at SHU, read the names of the 11 people who died in the shooting. The service included reciting multiple prayers, including the Kaddish, a prayer for the dead, and the Mi Shebeirach, a prayer for the injured. Members of the choral ensembles at SHU performed songs throughout the service, including Barechu, the Hebrew call to prayer. O’Brien said she helped plan the service with Gemma Del Duca, Wilda Kaylor and Rabbi Sara Perman. Del Duca founded the National Catholic Center for Holocaust Education (NCCHE) at SHU, and Kaylor is the associate director for the center. Perman is a retired rabbi and co-founder of the Westmoreland County Diversity Coalition. The NCCHE was established at SHU in 1987, and its mission is to “counter anti-Semitism and to foster Catholic-Jewish relations by making the fruits of the Holocaust scholarship accessible to educators at every level.” One of the events the NCCHE hosts each year is the Kristallnacht remembrance interfaith service to remember the “night of broken glass” in 1938 where Nazis burned down synagogues, vandalized Jewish businesses and homes and murdered over 90 Jews. 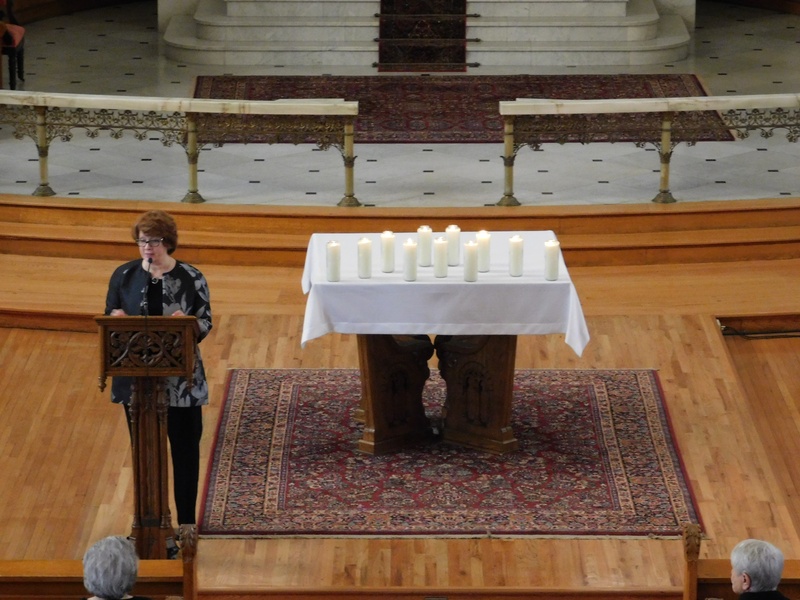 Seton Hill University President Mary Finger speaks at the memorial service in St. Joseph Chapel on Oct. 30 for the victims of the shooting at the Tree of Life synagogue in Squirrel Hill that occurred on Oct. 27. Photo by H.Carnahan/Setonian. Another event held in remembrance of the Tree of Life shooting victims at SHU was Unity Through Tragedy, an open mic event where students could express themselves artistically. Eye Contact Magazine, the Griffins for Human Rights Club, Students in the Arts and the Music Therapy Club collaborated to host the event, and many students performed songs or recited poetry. 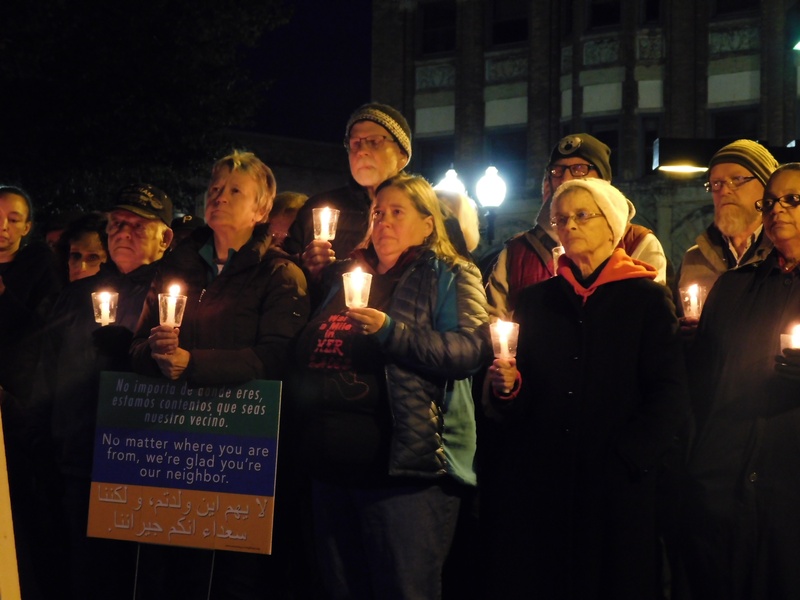 On Oct. 29, two days after the shooting, many members of the SHU community attended the candlelight vigil at the Westmoreland County Courthouse in remembrance of the victims. The Westmoreland County Diversity Coalition and Voice of Westmoreland collaborated to host the vigil. Among the speakers at the vigil were Barbara Einloth and Mary Norbert Long of the Sisters of Charity of Seton Hill. The Blackburn Center was present to provide counseling, and multiple groups played music during the vigil. VOW estimates that more than 600 people attended the vigil. VOW collected donations throughout the vigil for the Congregation Emanu-El Israel Synagogue Rabbi’s Discretionary Fund, which “provides assistance to individuals and/or organizations in need.” The Congregation Emanu-El Israel synagogue is located in Downtown Greensburg. Students from SHU also brought a gold branch to the vigil, where attendees could write messages of hope. The tree is now located on the third floor of the Administration building, where anyone is welcome to add a leaf with their own message, or to add or take a rock. 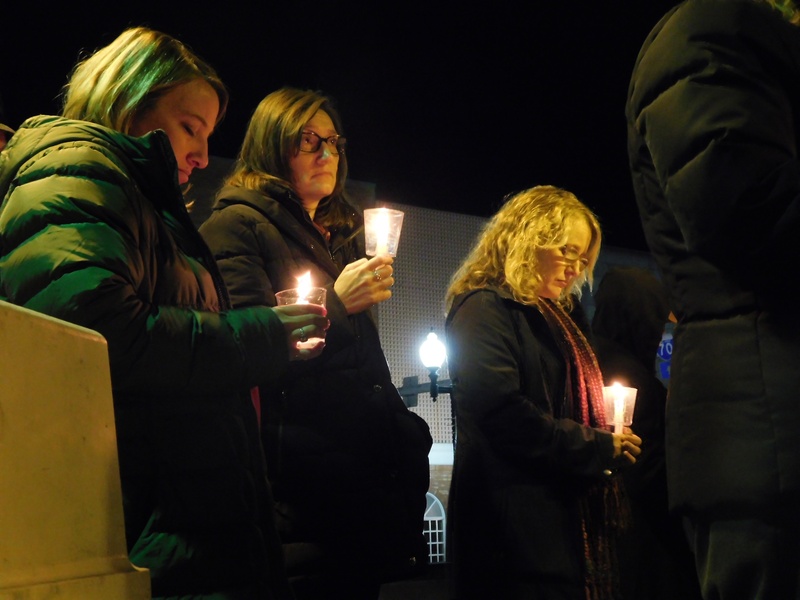 From left: Seton Hill University professors Jen Jones, Debra Faszer-McMahon and Christine Cusick hold candles at the vigil at the Westmoreland County Courthouse in Greensburg on Oct. 29 for the victims of the shooting at the Tree of Life synagogue in Squirrel Hill. The shooting at the Tree of Life synagogue was the deadliest attack on the Jewish community in U.S. history. To be considered a mass shooting, the Gun Violence Archive states that four or more individuals must be shot or killed in the same general time and location. With hundreds of mass shootings occurring in the U.S. each year, the question of gun control is frequently debated. “Common sense gun measures, eliminating some of these root causes are violence… those are some of the measures that we think need to be taken to change the culture of violence that has really become far too prevalent, not just in Western Pennsylvania, but across the country,” Pohland said. Moving forward, Pohland said she hopes the community continues to come together to make Westmoreland County a more welcoming and inclusive place. O’Brien said starting to combat discrimination in communities is important to prevent violence from taking place.